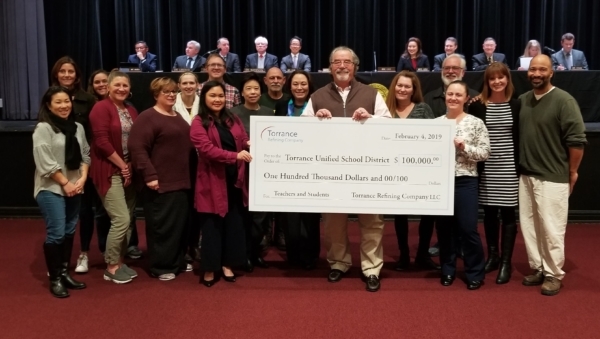 Torrance Refining Company LLC (TORC) representatives presented a $100,000 donation to the Torrance Unified School District (TUSD) at its Board of Education meeting on Monday, February 4. The contribution will fund the TORC Innovation Education Grant Program, which awards teacher grants that enable TUSD teachers to implement innovative Science, Technology, Engineering, Arts and Math (STEAM) curriculum in their classrooms. A showcase of the programs will be held in June. Click here to learn more about IEGP.